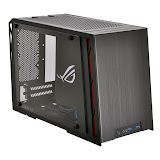 Asus ROG Certified gaming case. Supports two 3.5″ or 2.5″ drives,or 3.5″ drive and 2.5″ drive for each one. Support Slot-in CD-ROM drive. Removing the rack cen be mounting 3.5″ or 2.5″ drives.